When I was back in Michigan a couple weeks ago, my mom made a wonderful grass-fed English roast for dinner one night. After tasting it and all its glory, I vowed to make one upon returning to Portland. This past weekend, I was at the farmer’s market, I remembered the roast. So, as I was buying some grass-fed buffalo bones to make a batch of bone broth, I decided to pick up a small grass-fed roast as well. I kept things simple and that’s all this basic chuck roast needed! Anyway, I decided to make the roast in my slow cooker, which my mom said is the ideal way to do it. 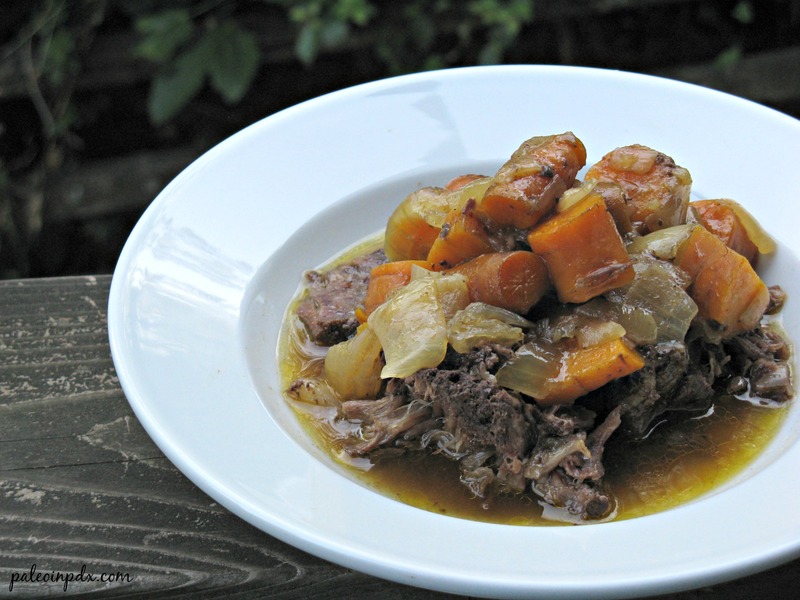 I believe her too — after all, the slow cooker makes everything better, juicier and more tender! My mom also told me to season and sear both sides of the roast in a pan on the stove before putting it into the slow cooker, which I guess adds flavor and locks in moisture. Makes sense. I’m glad she told me this though, because I probably would’ve just thrown it into the slow cooker completely raw had I not known. I’m still learning all these meat techniques, you know? After all, I had never cooked or even touched raw meat until last November and as the title states, this is my first roast ever! Needless to say, I’m learning all the time. Heat fat in a pan over medium-high heat. Season the chuck roast with sea salt and pepper to taste and then place in the pan. Sear about 4 minutes each side. Once done, place in the bottom of the slow cooker. Place the chopped onion and carrots around and on top of the meat. Season to taste with sea salt and pepper, and add the red pepper flakes, if using. Then, pour in broth and apple cider vinegar. Set the slow cooker on low and let cook for 7-8 hours. Alternatively, if you don’t have enough time, set the slow cooker to high and cook for 5-6 hours. Once done, shred the meat, if desired or cut off pieces to serve. Have you checked in with the eat right 4 your blood type focus at all? I don’t know what blood type you are, but I’m type O and buffalo meat is supposed to be the best for type o’s! I love it. 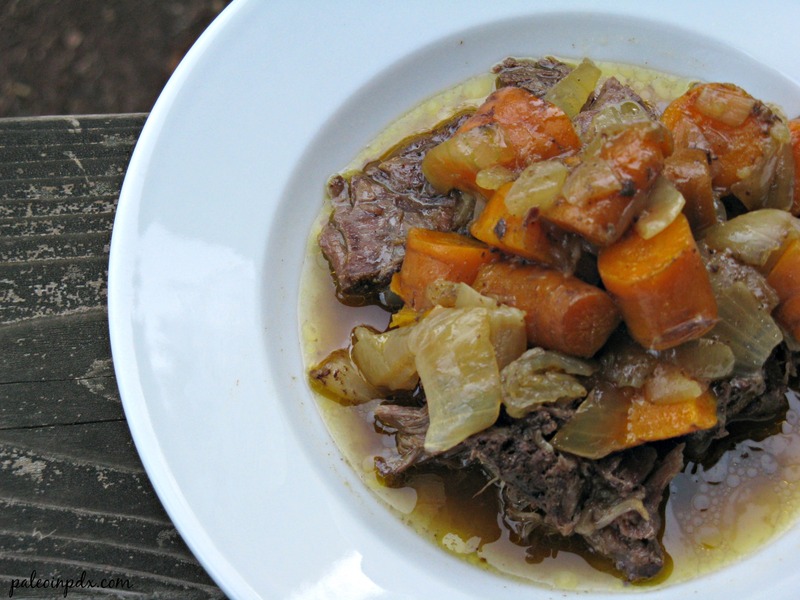 Looks like this will be a great hearty stew full of energizing meat to try. Thanks! I haven’t had a roast in ages. This looks *wonderful*. Thank you for the mouth-watering post! It was great and your suggestions were helpful! We would’ve loved to have you as a guest, Mom. Much love! You are making me want to eat red meat! I haven’t since I was about 14 yrs old! Haha! It had been a long time for me too before I started eating it again (10 years!). It’s tasted so good though, and my body has taken to it well. It’s all in the quality of the meat! I make mine in the crock pot as well—usually. You have the same crock pot as me! Thanks, it tasted pretty darn good too 😉 I love my crock pot! Thank you for the Pine Mountain Ranch lead! I make a similar dish … I do like to add herbs in as well such as a bay leaf, sage and thyme.